Developed by Richard W. Arms Jr., EquiVolume is a price plot that incorporates volume into each period. EquiVolume charts look similar to candlestick charts, but the candlesticks are replaced with EquiVolume boxes that can be square or rectangle. Classical patterns, such as triangles, wedges, and double tops, still show up with the added bonus of having volume built right into the pattern. This makes it easier to verify volume for reversals, big moves, support/resistance breaks, and climaxes. An EquiVolume box consists of three components: the price high, the price low and the volume. The price high forms the upper boundary, the price low forms the lower boundary and volume dictates the width. EquiVolume boxes are black when the close is above the prior close and red when the close is below the prior close. When calculating EquiVolume charts, note that volume is normalized to show it as a percentage of the look-back period. For a four-month daily chart, each day's volume would be divided by total volume for the look-back period (four months). As such, the width of each box represents the percentage of total volume for the look-back period. Big volume days take up more space on the X-axis (horizontal) than low volume days. With varying width, this means the date axis is usually not uniform on EquiVolume charts. Some weeks will extend longer because of wide candlesticks, while others will be shorter because of narrow candlesticks. Chart 2 shows a high-low-close bar chart for Kraft Foods (KFT) with volume and a normal X-axis. Chart 3 shows this same four-month period using EquiVolume boxes. The wide boxes show relatively high volume days, while the thin boxes show relatively low volume days. Also, notice that many wide boxes can expand the entire month on the X-axis; for example, January is much wider on the EquiVolume chart than with normal high-low-close bar chart. Volume is important for validating a move, in particular support or resistance breaks. A break on low volume is not as convincing as a break on high volume. Low volume shows tepid interest and weak buying or selling pressure. In contrast, high volume reflects elevated interest and strong buying or selling pressure. Chart 4 shows Caterpillar (CAT) with two small breakouts followed by one big breakout. The stock formed a falling wedge into early July and broke the trend line with the widest EquiVolume box in over a month. A break above the late June high was followed by a gap and another wide candlestick. Buying pressure was slowing picking up steam. The final, and biggest breakout, occurred with another gap and move above 38. This EquiVolume box is no doubt the widest in the last two months, which means buying pressure was the strongest in two months. Volume clearly confirmed these breakouts. Chart 5 shows Intuit (INTU) breaking support with a wide EquiVolume box. This move showed strong selling pressure that broke the September lows. High volume moves can also signal the beginning of a trend. Chart 6 shows Alcoa (AA) trending lower from early January to early March 2009. The stock firmed around 5-6 in March and then broke out with a wide EquiVolume box. This was by far the widest box in months. Such strong buying pressure confirmed the reversal and foreshadowed a rally back to the January highs. Chart 7 shows Goldman Sachs (GS) reversing an uptrend with three red EquiVolume boxes. The stock surged above 345 in late October, but moved sharply lower with a long-red-wide EquiVolume box in early November. Two more long-red-wide EquiVolume boxes followed as the stock broke support at 210. Together, these three EquiVolume boxes showed selling pressure intensifying. Goldman Sachs managed to bounce back above 235, but these EquiVolume boxes were narrower because of lower volume. Upside volume on the bounce was weaker than downside volume on the support break. Lacking conviction, this bounce failed and the stock moved to new reaction lows over the coming months. EquiVolume boxes can be used to identify exceptionally high volume periods that represent a volume climax. A typical selling climax involves a new price low, an intraday plunge and a strong intraday recovery with good volume. An EquiVolume climax occurs with an exceptionally wide box. Often the box is wider than it is tall. This represents a period of relatively little price change with high volume, which shows indecision that can sometimes foreshadow a significant move. Chart 8 shows Weatherford International (WFT) finding support in the 9-10 area from mid-January to early March. An exceptionally wide EquiVolume box formed on February 25 to further reinforce support and act as a volume climax. The subsequent breakouts at 11 and 13 opened the door to an extended advance. Chart 9 shows Akami Technologies (AKAM) with a big gap down and an exceptionally wide EquiVolume box that looks more like a square than a rectangle. This wide EquiVolume box acted as support in the 16-17 area. AKAM firmed for a few days and then gapped higher with good volume. After this short-term reversal and bounce, AKAM returned to the wide EquiVolume box and tested support here. Also notice that a falling channel formed. The stock successfully tested support and broke channel resistance with a breakout. Admittedly, the breakout lacked a wide EquiVolume box for confirmation, but held after a successful test at 10 in early October. EquiVolume boxes put price action and volume together for easy visual analysis. EquiVolume boxes plot the high-low range for length and volume for width. Thin boxes show relatively low volume, while wide boxes show relatively high volume. Square or wide boxes reflect high volume with relatively little price movement. Even with this added volume dimension, chartists can easily spot traditional patterns, support/resistance breaks, and reversals. Click here for a live EquiVolume chart. SharpCharts users can find EquiVolume under “Chart Attributes” and “Type”. There is also a volume option directly underneath. Users can choose to have volume “off”, “separate” or as an “overlay”. Volume can also be skipped (off) because it is reflected in the EquiVolume boxes. 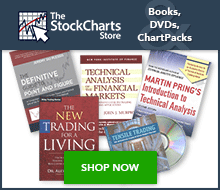 EquiVolume is not available as an indicator for scans at StockCharts.com. However, the general idea behind EquiVolume boxes can be captured by scanning for certain price and volume relationships. Richard W. Arms Jr. has a website with more information on EquiVolume, including a downloadable ebook: Trading with EquiVolume.